MSE is no affiliations with the city govt of Marikina and the Shoe Museum itself, contact their office, search it! @Anonymous: Sorry to hear your unfortunate experience. As far as I know, the Marikina Shoe Museum though has no affiliation with the Marikina Shoe Exchange. 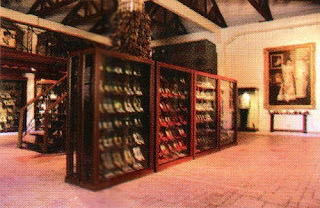 The shoes displayed in the museum are all old and historical. You can try to take it up directly with the MSE. I also suggest that if you can find a pair of shoes that's the closest possible design and feel to the pair you like, then buy it, as opposed to having a custom-made pair. I only say this based on your experience so you could see the actual pair of shoes before even deciding to buy it or not. can i bye shoes worn by imelda marcos? C'mon!!! think before you click... it's BUY! The shoes in the museum are not for sale, only for display. Why is it that visitors can't take pictures inside? That is such a turn-off since most travelers are bloggers. I wish taking photos was okay however limited to not being able to use flash. Some even more classy museums like the one inside RCBC Plaza do allow taking pictures although limited to certain items only. The museum is nice but very small. I had to pay 50 Pesos although this website says only Php40 for non-residence. The entire exhibit took about 15 minutes. I wouldn't take a trip to go there but a nice quick stop in you're already in the area. I haven't really seen that museum. I think it's the only place in the Philippines that has that kind of museum. It looks good to be there. Can help me plssssssss........ Can you give me the programs of Marikina Shoes Exchange... plss I need it this week.. I read this blog earlier at first I was worried that I won't be able to take pictures inside the museum but luckily we went there this afternoon, the staff allowed us to take unlimited pictures! Awesome! Ruthie, that's good. Cause a couple of years back, they didn't allow photography. You can use the map above as reference but if you're going to commute here's the easiest way. Take an EDSA bus and get off at Cubao. From Aurora blvd, ride the Cubao-Calumpang jeeps. The jeep will pass in front of The Shoe Museum. Your landmark is that once the jeep crosses the Marikina River, it will make a right turn (J.P. Rizal). 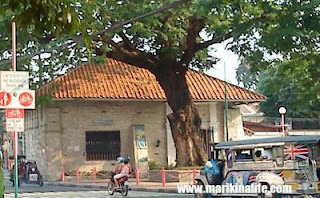 Less than a kilometer from there, you'll see the San Roque church to your right and the Otto shoe factory outlet to your left. Get off there and you'll see the Marikina Shoe Museum just beside Otto. how does it build the cultural identity of Marikina? From Katipunan, head to Aurora Blvd. and just outside of the Katipunan MRT station (Eastbound), ride the Cubao-Calumpang jeep. When the jeep crosses the Marikina River, it will turn left at JP. Rizal St. A few hundred meters away is a church at the left side and Kapitan Moy and Otto Shoe factory on the right side, immediately after to the right is the Marikina Shoe Museum. 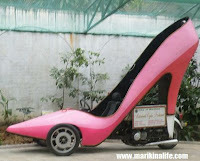 On seeing the picture giant pink heel car remembers me my girl friend's favorite heels and the day she ran with that heels on a race she got runner up but unfortunately she slip and fall after touching the finishing line. (Sooooooooooooooooo sad) . can i take pictures inside the museum? for case study and promoting the museum as a tourist destination. The last time I was there, there was a sign that said no photography. And they also call your attention if you do. But not sure if that may have changed. After all, everybody has a camera nowadays. I visited the Shoe Museum yesterday. It would be nice if the Shoe Museum included a history of the production of shoes in Marikina, and shoes made in Marikina. hi thanks for this information... does anyone of you can refer a shoe manufacturing/factory in marikina for our business?